As promised, here’s more on Taiwan. Street markets, especially night markets. have been part of Chinese culture for over a thousand years. Most Chinese historical movies have street market scenes where heroes and villains meet to plot. And indeed, this is why night markets were heavily regulated when Taiwan was colonized by the Japanese. Independent again, the night markets are thriving once more in Taiwan. This is a little shopping street parallel to the main thoroughfare and running straight onto Ita Thao Pier. 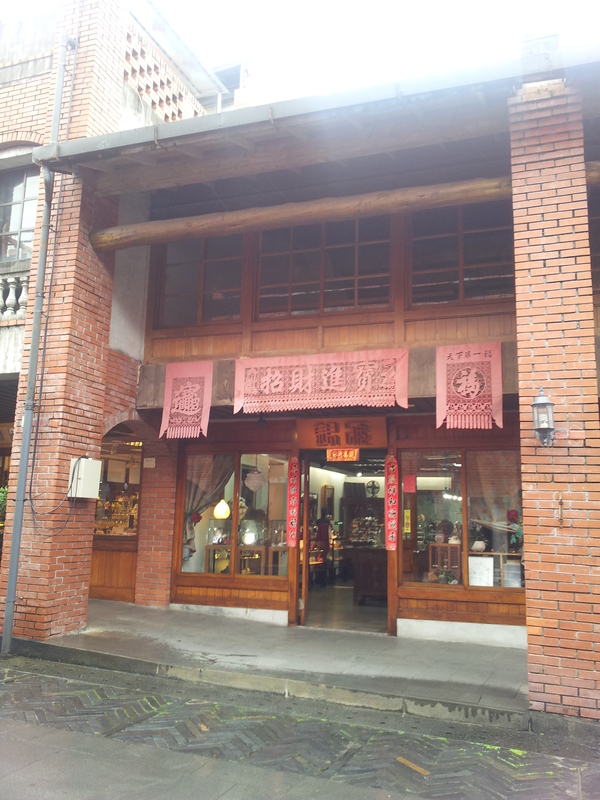 It’s distinguished by some very crafty souvenir shops – one that sells handmade owls (the district animal talisman), a privately owned pottery and Chinese glass gallery, a charming little Taiwanese sake and millet wine boutique, a home-made soap stand, a branch of a local pottery with a wonderfully helpful assistant. If you want the Taiwanese typical, there’s also a bubble tea shop, a Seven Eleven, and a stinky-tofu vendor. I liked the quiet village feel of the place and seeing the vendors dropping in to speak to each other and shop owners coming out of the private quarters to serve with a baby in their arms. This is the largest night market in Tainan Province and the largest outdoor night market in Taiwan. It moves about and sets up at this location on Thursdays, Saturdays and Sundays. This is the quintessential night market. There’s everything here – crowds of Hokkien speaking Taiwanese; a huge variety of food stalls; lots of clothing, hosiery, costume jewelry, T-Shirts with bad English and designer knockoffs; posters and home decoration items; a carnival section where lovers can shoot darts and guns for cuddly toys. The deep fried candied sweet potato and yam chunks are a must! The market also has lots of oyster omelet vendors. And, in a nod to globalization, Malaysian pulled milk-tea is immensely popular. Everything is delicious if you’re brave enough to try. Go easy on the temptingly gigantic grilled oysters though. Someone on the tour had six of them and ended up at the emergency room the next day with severe stomach problems. This one’s a theme park version of an old China market town. There’s a shopping street, a temple courtyard with an operatic stage across from it, a scholar’s house and lots and lots of shops. I confess – I like theme parks, I don’t mind their fakeness. And there’s really a wonderful range of stuff to buy here, none of it rubbishy. I opened my purse willingly for a hair ornament shaped like a lily from soft self-drying clay, a Chinese writing brush at the calligraphy shop, and some packets of sesame seed coated dried river fish and tea-roasted peanuts. The peanuts, with strangely blackened nuts inside, are a best buy. Everyone who’s tasted them says they are wonderful! This is a historic walking area consisting principally on one narrow street winding down the side of a hill. It’s a really pretty street line with Japanese style shops that sell a really interesting array of food and souvenirs. Unfortunately Jiufen is on the North East coast of Taiwan and it rains there 9 out of 10 days. I might have put Jiufen as #2 if not for the weather. As it was, we shivered our way down the street then up again, stopping every now and then for a sip of something hot to keep our body temperatures up. There are dessert shops all along the street, good places to stop at for the chewy yam and sweet potato nuggets hidden in warming sweet ginger soup. We went to one with a comfortable upstairs seating area and a wonderful view of a foaming Sea of Japan partially shrouded in mist. At the top of the street there’s also beef noodle soup shop and a fried prawn cake stall for another body warming snack after the walk. Lots of souvenirs on this street, but most looked like they were made in China. We stopped at a crystal shop with nice stones but didn’t buy anything. Being greedy guts, what we got were packets of pumpkin seed cookies and some candied fruit peel. Being a filial son-in-law, husband bought my father a retractable walking stick. We found out later that it would have been 30% cheaper in a department store in Taipei. Did I miss some markets you’re familiar with? There’s a reason. Watch out for the next post to find out why. Meanwhile, do let us know what you think about the 4 markets I’ve rated. I liked the Ita Thao Pier street market too! Although I visited in the daytime, not night, so the atmosphere was a little different! Food was still great though! Did you try the chicken wings stuffed with rice & the huge deep fried veggie ball?! My travel buddy & I were burning up eating it because it was so piping hot! Not on your list but I also really liked Liu He Night Market in Kaoshiung City! It was alot less crowded than the Shilin Night Market in Taipei but somehow I found it easier to eat & enjoy the food in a simpler night market! Thanks for sharing Audrey! Time for me to go on a diet! I competely over-indulged!